Our healthy homestead is located in an extraordinarily peaceful area with an herb garden. Herb hikes are free for our guests. There is a petting zoo for the children as well as fresh milk, yoghurt, and homemade bread every day. Our cow, Mary, makes lactose-free milk! How is that possible? The Gold Summer Card includes free entry to the swimming pool, the Badesee, and the indoor swimming pool. During the summer, it provides free access to all tramways and the bus! The home sits amidst the gorgeous skiing regions of Fiss, Serfaus, Nauders, and Fendels; and there is always sure to be snow on Kaunertal Glacier. Night skiing is available here, but you can also let loose on the well-lit natural toboggan run. 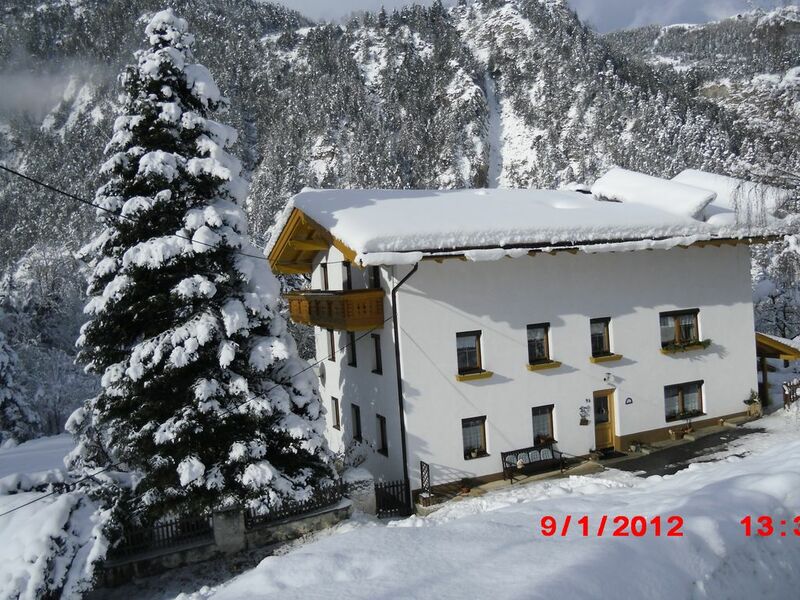 The home is centrally located for plenty of outings to Italy and Switzerland. We use nature to keep our property clean (with effective microorganisms), which is good for humans, livestock, and the environment! May and June packages include: 1 week with herbs, incl. herb hike, treatment, and tasting for 320 Euros per person; Pure Nature is the Best Cure: Pony rides for children up to 14 years, 1 free hour with weekly booking, each additional hour charged to the guest. Our rabbits, cats, bantam hens will help you forget about your favourite TV shows. On 24 May 2013, we welcomed Josy’s sweet foal! Can you think of a name for her? You can play games with your parents by the babbling brook–there is so much to discover that you’ll never be bored. In the winter, we make our sleds available for a ride along the natural toboggan run in Ried and, this year, a wonderful cross-country skiing route was arranged right by our property! During the summer, I would like to invite you to come take an herb hike with me and, if you like, I can also teach you some herbal beauty techniques. For something a bit more sporty, we make our Nordic Walking poles available to you free of charge. Kneippists can enjoy a wonderful dew treatment in front of the home, freshen up with some homemade lotion, and, perhaps, take a stroll afterward, or: if you like, we will gladly spoil you with our popular, organic homestead breakfast (made with home-grown products!) in our cosy, Swiss pine living room with tiled stove and play area for your children. Enjoy the fresh eggs from our pampered, free-range hens, let our homemade yoghurt melt in your mouth, drink some fragrant herbal tea, and try some of our homemade breads, jams, and fresh butter. The day could not start off any better! Living in and with Nature: Since we love our “sacred world” and want to preserve it, we wash all laundry with a homemade detergent – it was our grandmother’s recipe. It goes easy on the skin and on the environment! We have been renting to others with great pleasure for over 50 years! We change a little for the better nearly every year. As an herbal instructor, I love nature and I probably have an herb for anything that ails you. Rejuvenate yourself in this powerful space! I have lived in this house since my birth in 1955 and I feel great. Our guests say that our home has a uniquely positive energy. Looking to completely unwind? Want to put your mind at ease? Or just simply turn off, be present, and enjoy some peace and quiet? Then come stay with us and try some herbs while you stay. It will be great for you! With a 1-week booking, we provide you with the Gold Card, which gives you free access to mountain trails, baths, and leisure activities! The bus is free, too! 1 hour of pony rides at no cost!! There will be no fighting for the bathroom in the morning with two showers/toilets, hairdryer, makeup mirror, toilet paper, hand and bath towels also available. We love nature and heat our home with our own wood! You will feel right at home in the living room with cushioned furniture, satellite TV, and pinewood cabinet. Upon request, we will happily prepare an extensive breakfast, with home-grown, organic products in our cosy, herbal tea sitting room. Interested in some true Tyrolian fare? A wonderfully-fragrant herbal tea is great after a hike or a day of skiing. Our Swiss pine sitting room, by the cosy warmth of the tiled stove and with a glass of home-brewed Obstler, can really set your mind at ease and push the ‘everyday’ far, far away. Our bedrooms are beautifully crafted from our own wood. The entire home is furnished with exceptional, maple-parquet flooring, which was naturally sourced as well. There are stunning views from the southern balcony of the lovely environment around you and the herb garden. The spacious living room is outfitted with cushioned furniture and a pinewood cabinet, which imparts the room with a wonderful smell. 2 showers/toilets for maximum comfort! We were for skiing, two families with childrens. Place was very big and clean. Lot of space, warm. Owners is very kind persons and you can expect help in all situations. P.S. Two things you should take into account before coming. 1. Around are lot of friendly animals, it could be an issue if someone is allergic to animals. Wir haben bei Familie Maas in der Nähe von Ried gewohnt und waren in Fiss zum Skifahren. Wir wurden sehr freundlich aufgenommen und die Familie war uns immer behilflich. Die Wohnung unterm Dach ist sehr großzügig und geschmackvoll eingerichtet. Wir kommen gerne wieder. Liebevolle Menschen und ein wunderschöner, kraftvoller Ort. Schon seit vielen Jahren kehren wir als Familie immer wieder auf denn Bauernhof zurück, um uns eine Auszeit vom Alltag zu nehmen. Es ist einfach wunderschön und liebevoll auf diesem Bauernhof und das zu jeder Jahreszeit. Sehr ruhige, familienfreundliche Unterkunft. Wir haben uns sehr wohlgefühlt. Frau Maass versorgte uns gern mit hofeigenen Produkten und ist auch sonst sehr um das Wohlergehen ihrer Gäste besorgt. Vielen Dank für die schöne Zeit. Wenn wir wieder ins Oberinntal kommen, dann garantiert wieder hierher. Wir haben unsere Woche Skiurlaub in der Ferienwohnung von Frau Maaß sehr genossen, vielen Dank für die tolle Woche in der wunderschönen Wohnung. Ich bedanke mich sehr herzlich für Ihre positive Bewertung! Wir freuen uns schon auf ein Wiedersehen mit Ihnen samt Familie! Ried is located 875 m above sea level, at the feet of three treasure troves of winter sports: Serfaus, Fiss, and Ladis. The area has retained its rustic character and is slowly increasing in popularity with tourists. There is something for everyone here, from private rentals to the best hotels. Nestled between the imposing Samnaun Mountains and the Ötztal Alps, the surroundings offer visitors a world of possibilities. Some activities are: tandem paragliding, rafting, kayaking, paddle-boating, climbing, Nordic Walking (free pole rental). Skiing: Roughly 10 kilometres up from Ried, you can hit the slopes in Tyrol’s new ski zone, Sefaus-Fiss-Ladis. A ski pass, the Ski6, offers access to over 320 kilometres of pistes within a 34 kilometre radius. A choice of 5 skiing areas is available: Serfaus-Fiss-Ladis, Ried-Prutz-Fendels, Kaunertal Glacier, Venet, or Nauders. In the summer, the Badesee entices visitors with its beautiful surroundings, adventure pool, and the countless attractions in Serfaus, Fiss, and Ladis – plenty of fun for the children! Do you prefer the peace and quiet of nature? Then you will be thrilled by nature program at the Kaunergrat nature reserve. Or maybe you would like to take part in one of my herb hikes through the endless beauty around the Kaunergrat and marvel at the many flowers, grasses, trees, and other flora.